Been playing with jevois and Niryo locating ArUco codes in 3-space and discovered a strange z-axis offset of 12-15mm below the table to which NiryoOne is mounted. I wonder if this is a calibration issue or a coordinate frame definition issue. Can you please provide a diagram of the XYZ coordinate frame reference point and orientation? By this I mean the frame to which set_pose refers to. Thanks so much for NiryoOne! Yes! That is my point exactly. The modeled xy-plane does not agree with the actual xy-plane. This is on two separate arms, so I think the problem is systemic. The top image below shows that the modeled xy-plane is level with the base. The bottom image shows that the actual position is over a cm below the base. This reply was modified 2 months, 4 weeks ago by wyojustin. Thanks for the photos, we’ll investigate this issue and will update the dimensions on the software if needed! I’ll post a follow up here once we have found something. Thanks! Looking forward to get update. 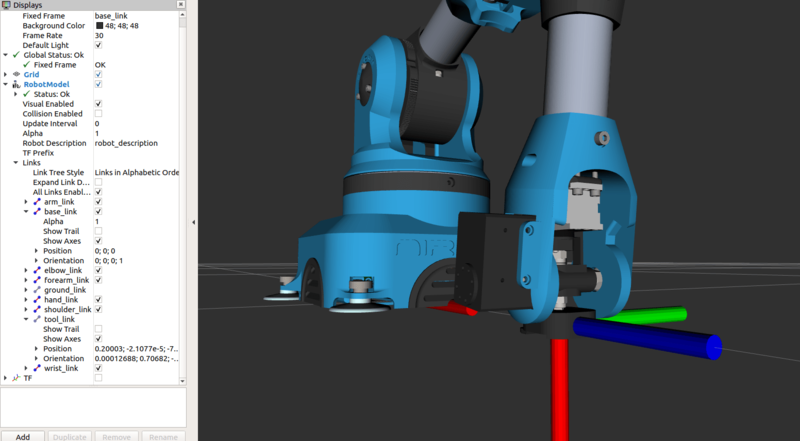 which is off by about 7mm in x.
TF->hand_link-> Relative position, I see the x offset is set to 16.4mm in stead of 23.7mm. That account for the descrepency. This reply was modified 2 months, 3 weeks ago by wyojustin. I have checked again the values, but the values in URDF seem to be correct. 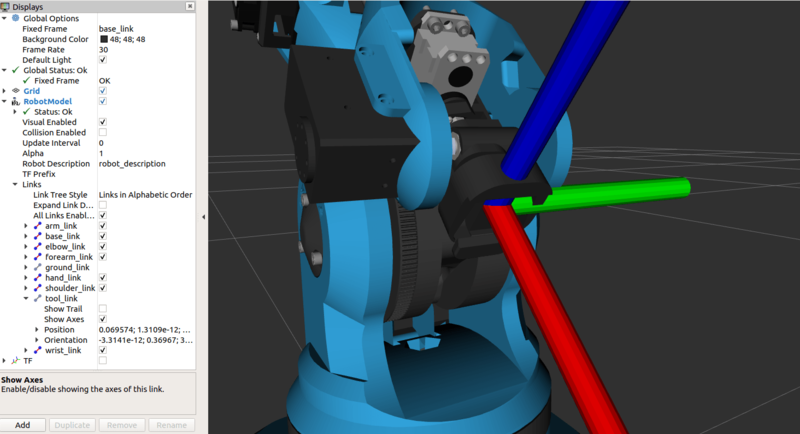 In the mechanical specifications, the distance between the joint 5 (axis 5) and the tool joint is 23.7mm, or 0.0237 m.
In URDF, you can find “distance_wrist_hand_x” at 0.0164, but also you have “distance_hand_tool” at 0.0073. The sum of the 2 is 0.0237. In fact (software related only), the robot doesn’t have 6 joints, but 7. The 7th joint is a fixed joint just for defining the distance between the hand base and the tool base, and putting an easier-to-use orientation for the user. I have just made some tests in simulation and with a real robot, and found correct results. See here the result for Pose command (pos.x: 0.2, pos.y: 0.0, pos.z: 0.0, rot.x: 0.0, rot.y: 1.57, rot.z: 1.57) done from Niryo One Studio. I get the exact same position with the real robot. @wyojustin could you check again with those settings ? Also what command tool (Niryo One Studio, Python API, …) did you use so you get your result with the position issue ? Thanks for checking. I will repeat the experiment when I return home tomorrow. Ok, I can confirm that BACK of the tool connector is the reference point. Thanks for looking into this! Issue is closed.